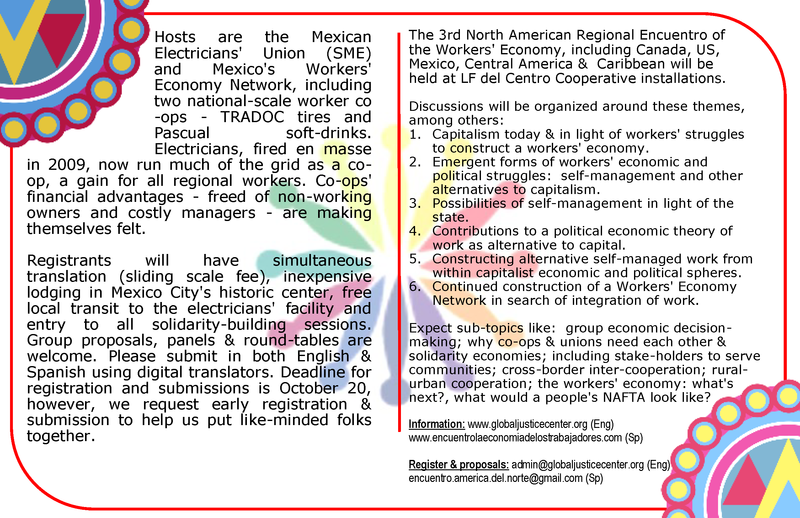 We are currently inviting USian and Canadian participation in the forthcoming Workers’ Economy, 3rd North American Region “Encuentro” November 8-10 in Mexico City. It aims at building solidarity among participants in unions, worker co-ops and solidarity economies in Canada, US, Mexico, Central America and the Caribbean. Main hosts are the LF del Centro Cooperativa (now owned by the Sindicato Mexicano de Electricistas) and Mexico’s branch of the Workers’ Economy Network which was born in Buenos Aires in 2007. Gratis registration and submission deadline is October 20 but we ask for early inquiries to help organizers get like-minded folks together. A sliding-scale fee will be assessed non-Spanish speakers in order to compensate interpreters.